Debbie Morris, Cannon County Register, and Bobby Smith, Cannon County Court Clerk, presented an educational program about historic records of interest to researchers on Aug. 19 at the Auburntown Historical Society meeting. 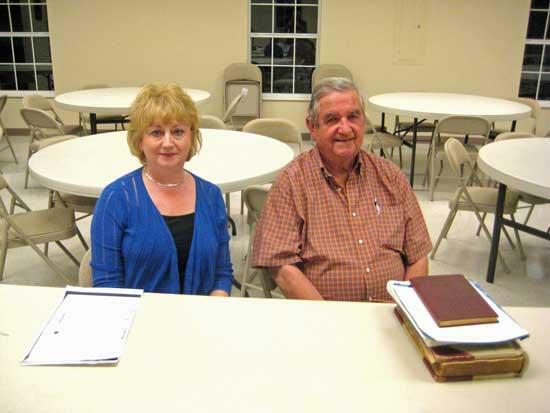 Two newly reelected Cannon County officials were guest speakers at the Auburntown Historical Society on Aug. 19. Debbie Morris, formerly of Auburntown, and County Register since 1986, joined Bobby Smith, County Court Clerk since 1978, to discuss the types and availability of historical books and records kept by their respective offices. Morris noted that although a devastating fire destroyed the Cannon County Courthouse in November of 1934, all the deed books for the county back to 1836 survived and remain available for public use. Smith pointed out that only one book (Marriages of 1929-1934) from the County Court Clerk’s office was lost during the fire as it had apparently been left laying out on a counter. Otherwise, his department also maintains county record books extending back to the founding of the county in 1836. "With a total of 56 years of service and experience between these two county officials, we know their knowledge of public records will continue to be indispensable as we move forward with the history of Auburntown book project currently underway," said AHS member Danny Nichols. The Auburntown Historical Society meets monthly from January through October at the Fellowship Hall of the Auburntown Church of Christ. The public is invited and encouraged to attend these meetings. For information about AHS activities and membership, visit www.auburntowntennessee.blogspot.com.